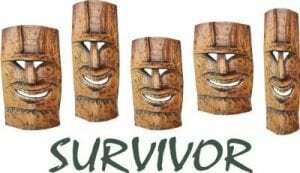 Survivor party theme is very popular on this site. It has it all: a suspense, a mental challenge, and a test of strength and endurance. Invite your friends over, and challenge them to outwit, outplay, and outlast the competition. I’m sure they will have a fantastic time! For your Survivor party invitations, find the TV show logo on the internet. Then print the image on white index cards. Write party information on the blank side. The wording can start with “Congratulations! You’ve been selected to take part in taping of Survivor (Name). Please report to the main camp at (time) on (date)”, etc. Tip: Look up “Hawaiian name translator” on the internet, and then type in your name to get its match in Hawaiian language. Use your Hawaiian name in the Survivor party title. Ask the guests to wear comfortable shoes, and bring a swimsuit, towel, and a change of clothes, if needed. Lime, green, turquoise are fabulous colors for Survivor party decorations. Set up a fire in your backyard, and scatter around some tiki “castaway” torches along the walkway. Play Survivor theme music throughout the party. Put colorful cloth over the party table. Place a mask or an idol for a centerpiece. Fill up the empty space with balloons and streamers in theme colors. Before the party, fold and place bandannas in 2 colors in a box. When the guests arrive to the party, have them pick a bandanna from the box without looking. This is the best and most fair way to divide the group into tribes. Have one of the party helpers act as a host of the show. He or she will go through the rules, as well as interview the participants at the end of the party when it’s time to cast a vote. There are different items that you can give out: cool t-shirts, bandannas, postcards of exotic destinations, theme posters, Survivor memorabilia, leis, flip flops, and so on. When organizing your party games, I recommend a set-up with team and individual challenges. At the end of the party, the contestants vote for the sole Survivor. The party starts with 2 tribes competing against each other. Then at one point during the party, the tribes “merge” and players compete individually. You have a couple of options for determining the winner. First, you can have the players vote for someone who they think outperformed everyone else in the challenges. This works best when you have an older group of teens or the guests don’t know each other very well — so there are no “popular” votes. Second, you can create a point system where the participants get points for finishing first. For example, in team competition you can have all members from the winning tribe getting 100 points and members of the other tribe getting 80 points. Set up a point structure in individual challenges too, where everyone gets points depending on where they finish in each challenge. To make sure that everyone is having a great time, I don’t recommend voting people off after challenges. *Build a Shelter: Place 2 identical packed tents on the ground. Have the tribes compete trying to build their tents the fastest. *Blindfolded Challenge: Set up an obstacle course in your backyard by using chairs, cones, tires, a kiddie pool, and so on. At activity time, blindfold all players except for one member from each tribe. Have the participants decide who that will be. Those 2 people will verbally guide their tribe mates (tied to each other) around the obstacle course. The tribe that finishes first, wins. *Water Relay: Here is a fun team water relay. Place 2 empty small buckets near the starting line, and 2 buckets filled with water on the opposite side of the area. Give 1 sponge to each tribe, and have them transfer water from one side of the area to another in a relay format by soaking and wringing out the sponges. The tribe which bucket overflows first, wins. Announce that the tribes have merged into one. All other challenges are individual ones. The players race to get as many marbles as they can with their toes in 1 minute. *Food-Tasting Challenge: Before the activity, prepare some unique foods: grapes and cheese covered with salt, mashed potatoes with candy in it, or a rare vegetable (ex. jicama) raw or steamed. Blindfold the contestants, and get them to guess as many food items as they can. Award points for the most correct answers, and declare a winner at the end of the activity. *Word Scramble Challenge: For this Survivor theme party activity, print lists of scrambled words (available online) on sheets of paper. Invite the participants to unscramble the words. *Survivor Trivia: Play a trivia game. Categories may include common knowledge, pop-culture, geography, languages, movies, music, and so on. *Final Vote: Interview each contestant in front of the group asking about the competition, other players, and where they think they stand in the competition. Then have them walk up to a table a distance from the seating area, where they write the name of a person on a piece of paper, and say into a camera why they choose him or her. The explanation must be valid: they can’t choose somebody because he or she is their best friend. The camera also gives evidence that no one has put their own name. Finally, tally the votes and announce the Survivor. Award prizes to all the contestants. *Survivor Cake: Bake a rectangular cake. Let it cool and frost it white. Download a picture of Survivor logo off the internet. Use that image as a template to outline the logo onto the cake. Then ice the cake in Survivor colors. *Pineapple boats: Slice a pineapple in half lengthwise, removing the insides. Next, refill with pineapple chunks, cherries, raisins, and coconut. *Ants on a log: Cut celery in about 5″ lengths and fill with almond butter. Put some raisins (ants) on top.